Natural source formulation relieves joint pain associated with arthritis using ASU (Avocado Soybean Unsaponifiables). This leading formula:Reduces inflammation, Aids in production and repair of connective tissue and helps in collagen formation. Includes the medicinal mineral Lumanite, which rebuilds joints. When used daily, it targets frequent and severe joint pain, providing you with healthy, pain-free joints. Non-medicinal: Gelatin, Magnesium stearate, Silicon dioxide..
Gluten Free, Yeast Free, Sugar Free, Dairy Free. No artificial preservatives or flavours. For Adult population only. Do not use if you are pregnant or breastfeeding. Consult a health care practitioner prior to use if you are following a low-protein diet, if you are taking blood thinners, anti-platelet medications or antiarrhythmic medication. Consult a health care practitioner if symptoms worsen or persist. Adults: Take 2 capsules in the morning and 2 capsules in the evening. Best taken with a meal. Use for a minimum of 2 months to see optimal results. Try reducing to 2 capsules per day after 3 months. Do not exceed 8 capsules per day. Lakota was founded in 2000 by a father and son team of farmers from Northern British Columbia, Canada. By 2005 Lakota was the top selling pain relieving rub in Canada. Rooted in traditional medicine and made with natural ingredients. It works to relieve your joint, muscle, back, or arthritis pain. Lakota is a great alternative to conventional drugs. Lakota is herbal medicine: white willow bark, yucca root and devil’s claw, boswellia and others; combined with modern, natural ingredients such as glucosamine, ASU (Avocado Soybean Unsaponifiables) and collagen type II. The roll-on and soft touch products are based on a natural pepper extract that actually blocks pain at the source. When it comes to pain relief, Get Medicine That Works! 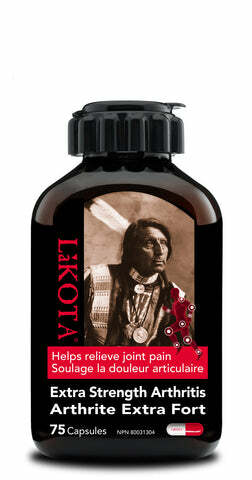 Try Lakota to relieve your pain.